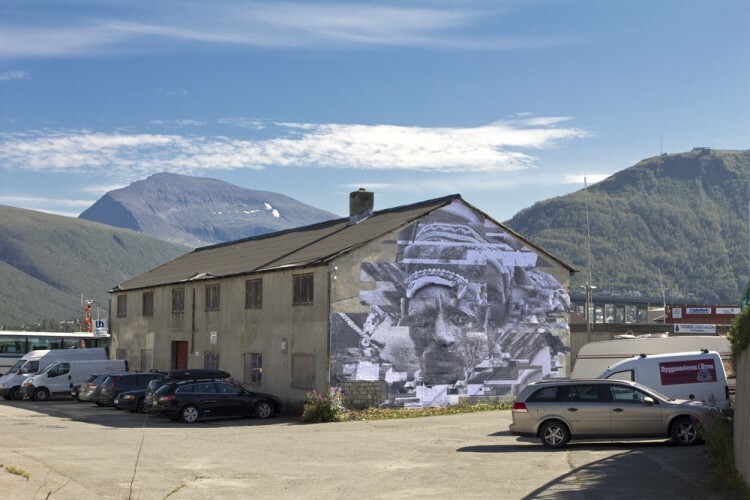 “Glitch” of print-paper on public wall, 2013. Visibility: Seen by drivers from the road with the most traffic in northern Norway. Location: Tromsø, Norway, 400 km. north of the Arctic Circle. 2013. Subject: The Sami People. The Sami are an ethnic group which sparsely populates northern Norway, Russia, Finland, Sweden, with descendents in Northern America and also, according to official statistics, in Ukraine. The self-designation of the people is “sami”, “saami» (sami) — which according to some versions, derives from the Baltic word * ẑeme («Land”). In a world that tends towards globalization, with homes filling up with Ikea stools, Coca-Cola and hamburgers — there is a blurring and loss of cultural knowledge and social uniqueness of small nations around the world. There is a forced destruction and self-destruction of difference. The social meat-grinder indiscriminately creates a total viscous mass out of us. How: Glitch — for me a glitch is a visual representation of memory, recollections, situations when we remember the object, but cannot catch details. It is like a dream, like an attempt to remember the dream. A glitch is honest, an attempt to get out of deceptive reality, out of the artificial manipulation of consciousness with sweet / vulgar / quality visual imagery of advertising space, out of branding systems and embellishment of everyday life. The poor image is authentic / truthful. Glitches are very architectural, geometric, but inconsistent. This is very important. Every art work created in a city, must not spoil its architecture. Straight lines and simple geometry only underscore modern architectural forms. Place plays an important part. The archetypical shape of the building in cross section (like when a child draws a house) is a sign (house / land / people). It is close to nature, to mountains, to water. The shape of the house, is the shape of mountains; the shape of the mountains, is the shape of the land.